Download Android Multi Tools v1.02b For Windows PC. I have provided an official link to download it directly from the developer website. (Setup+Drivers). Supported for (Win 8/8.1/xp/vista/10) for free. 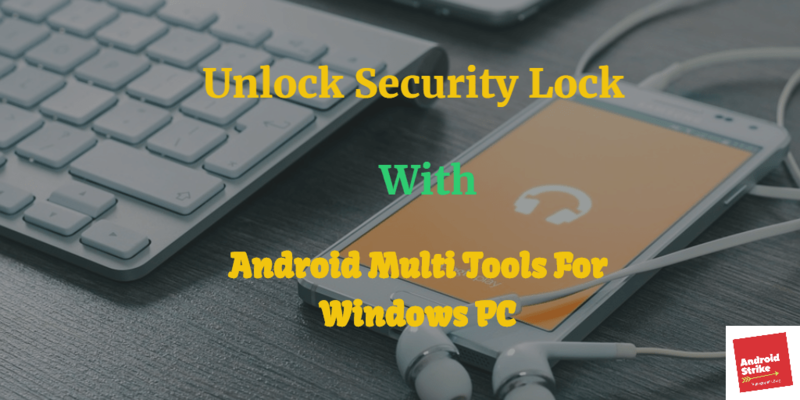 Android Multi tools is the best software to unlock any Android Mobile Pattern lock using Windows PC. Today on, Androidstrike I am going to share a fantastic trick to open Android Pattern Lock with one click of your mouse. Almost, 50% of the people forgotten their Android Pattern Lock or Passwords due to some reasons. In this case, You are wasting a lot of money by giving it to Mobile Service center or showroom. But, They are making tons of profit daily by unlocking a bunch of pattern lock using Android Multi Tools. Let us we know, Some Useful Advantages of Android Multi Tool ( Pattern Lock Remover). It is the Multi-Purpose Tool, which is used to remove forgotten Pattern Lock entirely on your Android device Not only unlocking Pattern Lock. It is also the best Flashing tool for many branded phone. ( Sony, Asus, Motorola, Lenovo, LG, and Samsung). Rest of the pros we will see below. Install .exe file of Android Multi Tools if you have already. If not, Don’t worry. I have Given the downloaded link below. Note: – Follow the Guide Properly. Make sure that your smartphone has at least 50-70% of battery. Because Few smartphones have no option to charge via PC USB Cable. Run the installed Setup file and connect your Android Mobile to Your Computer. Check whether your PC detects your smartphone. Otherwise, Try installing drivers for the particular device. If you want to Remove Pattern Lock on Android Mobile, Press 1 and check the device is connected securely. Now your Phone will restart, and Enjoy Working On your Phone. I hope that you have liked this Complete Guide on How to Remove Pattern Lock Using Android Multi Tools for Windows PC. Spread this word to your friends and families and help them too. If you have any doubt contact me below in Comment section, I will help you as soon as possible. Thanks for sharing such a useful information. Now a days every 2nd person is dealing with this issue in their phone. I would really appreciate your efforts for giving us this information. Very informative and useful post! Thanks for sharing! Wow. Thanks for all the information. Thanks for the tip and information. Very helpful. You can know more about tech tips and Android tricks.keep visiting..!! Sorry for the inconvenience caused to you. I have uploaded the download link of Android Multi-tools in Google Drive. So, You can download the file without worrying about the Malware. Asking for password? What is the password to open it?